Recipe 75: Finally it arrived the summer also in London, but i swear last weekend was still very cold and it rained like in winter, so i decided to cook the last winter dish of the season: Polenta! I prepare starer and main course with that but i think you can enjoy the same starter also with a good weather like in these days. Ingredients: i bougth the quick Polenta in Carluccio and they sell it in packet of 500gr, but you will need for 3 people no more than 250 gr, then butter, some cheese like brie or better gorgonzola if you like it, Parmesan, salt and pepper. If you prepare the polenta with the quick prepared flour, it’s really quick and easy, otherwise you will need to spend much more time mixing the ingredients. Instead in this case you will just need to boil 1 litre of water and the pour the polenta flour little by little always mixing and adding 1 and half little spoon of salt and some grated pepper. After a bit the flour will start to take consistency and it will almost appear like mash potatoes. Keep on mixing for 8 minutes trying to eliminate any clot. Then just turn off the fire and place it in a container with some baking paper to et it cold down. Now the polenta will be so thick that you will able to cut it in pieces, so you can decide to serve it as a starter or just as a main course. For the starter i suggest you to cut it in little pieces and put it in the oven with some piece of brie or gorgonzola. Cover them with another piece of polenta and put a bit of butter and parmesan on the top. Put it in the grill for some minute until the cheese will be melted and the top a bit crunchy and brownish. i serve it in a plate with some fresh celery and humus. For the main course you will absolutely need a meet sauce to serve with eat, so i suggest you to see the previous recipe. With the involtini and their sauce it was just perfect! PS. Mamy l’altra settimana ho finalmente comprato la polenta. Faceva un freddo tale che ci stava proprio bene! Ho pensato di cucinarci sia un piccolo antipasto, tipo mini polenta concia (come mi manca quella di campiglio) e poi l’ho servita con gli involtini ed il sugo di carne! Semplice, rapida e buonissima! I will open my new “Product testing” category writing about some of the elements to prepare a good italian aperitif… that i miss sooo much. At the Dolce Vita Event there were really too many things i could have bought, but here i have some selection: cheeses, olives and a drink of course. Between the big variety of cheeses presented in the event i choose some Gorgonzola made with goat cheese, some Robbiola, some Toma from Piemonte, another very strong and tasty cheese similar to Pecorino and finally some Parmesan. It can never miss. Here i need to thanks Lemons and Co, for their amazing Nero D’avola Cream that made the meal even richer and tastier. Lemon and Co, provides quality sicilian products like jam and sauces (i tried the olives and almonds one… very very good) and this innovative cream made from this quality of red wine grapes very characteristic in the island. It’s perfect with hard seasoned cheeses. Then i need to admit it: i love olives and when i saw the Sapori D’Italia stand i couldn’t resist and i bought some marinated green pitted olives called Boscaiola (very big), and some marinated mixed vegetables called Antipasto! They are a family-run business with shops here in UK and i was really happy to find all these traditional products there. Unfortunately the only thing that was missing in the event, was a nice stand with Italian bread… i miss the Rosette and the Casareccio bread sooo much!Let’s see if someone will bring it in the next edition. I also hope in some Mortadella… please! And to close the aperitif i have to mention another traditional protagonist of my italian Aperitivi in the local square: Il Bellini. When i saw this little nice bottle between all the wines and liquor stands, it was emotion! Ok it’s not fresh made but do you know what it means to look for fresh white peaches with some taste here in London??? Produced by Canella, they have also a really nice blog. 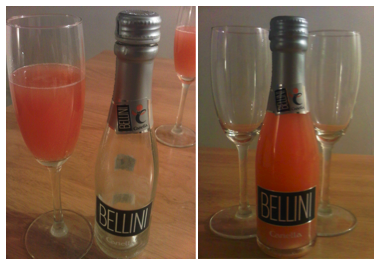 So WELCOME to the Bellini Cocktail and good Aperitivo to everyone! PS. Mamy questi sono alcuni dei prodotti che ho trovato all’evento di cui ti dicevo. Alcuni li abbiamo comprati ed altri mi sono stati regalati per testarli. Non sai che piattini con tutte queste delizie! Recipe 110: This is one of my father’s favorite recipes and the chef in this case is not my mum, but a couple of friends of my parents. They cooked this pasta for them a while ago and my father always remember this dish… so now it’s my time to cook it. The ingredients for 4 people are: 400gr linguine – 110gr Gorgonzola – 150gr pancetta (better guanciale if you can find it somewhere) – 125gr of single cream – salt and Parmesan of course! The recipe is very easy: put a little spoon of olive oil in a pan and cook a bit the pancetta. When it’s ready take it off and put it in a plate. Use now the same pan to melt the Gorgonzola and add a bit of single cream to help you. In the meantime in a saucepan you can also boil the water with some salt. After some minute add the pasta and wait around 10 minutes for the linguine. The sauce in total won’t take more than 10 minute to be ready, so you can cook everything in the same time. When the gorgonzola has melted, put back the pancetta and the rest of the cream and cook it another bit more.Then drain the pasta and put it in the pan with the sauce. Add Parmesan and it’s done! PS. Mamy finalmente ieri mi sono cimentata nella Carlona anche se ho dovuto sostituire il guanciale con la pancetta e gli spaghetti alla chitarra (introvabili qui) con le linguine. A me e’ piaciuta un sacco, mentre Nat l’ha trovata buona ma non supera le sue favorite. Comunque e’ semplicissima e rapida da fare … non ci vuole proprio nulla. Che te ne pare delle foto? e’ proprio come quella di Marcella? Recipe 121: A real classic recipe, super quick, good and very easy to realize is Gnocchi with Butter and Sage. In this case I decided to slightly change the ingredients to make it a bit more tasty (considering the Gnocchi are from London) but without the butter. So here are the ingredients you will need for 2 people: 400gr potatoes gnocchi – olive oil – 1 onion (i used a red one) – 80gr Gorgonzola – a bit of milk – 1 glass white wine – some sage leaves – Parmesan – nutmeg – salt and pepper. Normally i would just put some butter in a pan with the sage leaves in pieces and i would add the gnocchi after. Try this if you have some fresh italian gnocchi. Instead for this recipe you have to cut the onion and put it in a pan with some olive oil. When cooked add some white wine and wait until evaporated. In the meantime cut the gorgonzola and the sage in pieces. At this point, add the cheese, the sage and some milk, and on a low fire, let the gorgonzola melt slowly. When the ingredients are become a cream, close the fire and just add some nutmeg and salt if needed. In a big saucepan, put a good quantity of water and let it boil with salt. Then put the gnocchi in the water and after maximum 2 minutes, when they finish to come up, take them off the fire and drain them. Finally just add them to the sauce and mix until all the gnocchi are covered by the cream. Put them in plates with a bit of Parmesan and pepper if you want. The dish is done! Enjoy! PS. Mamy questa e’ la prima volta che cambio questa ricetta, ma sono talmente rimasta male dal sapore degli gnocchi le altre volte che li ho fatti solo burro e salvia, che questa volta ho deciso di aggiungerci anche un po’ di gorgonzola… e ci sta proprio benissimo. Lo so e’ pesante in ogni modo, ma almeno sa anche di qualcosa. 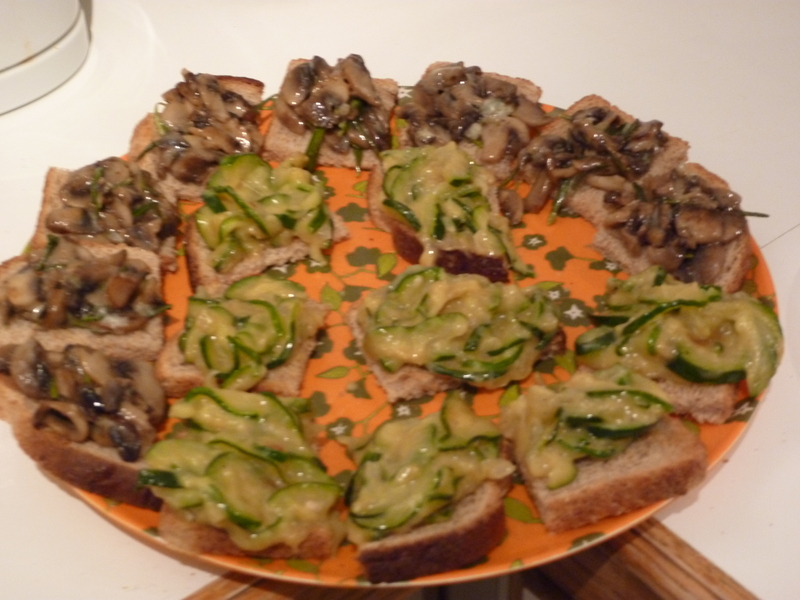 Recipe 127: This post is about the starters we served for Halloween but the recipes are easy and good for every occasion. We were in 8 and these are the ingredients I used. For the Black Coffins Cases you will need: 100/120gr gorgonzola – 12 slices of toasted bread – 25/30 black pitted olives – 2 little spoons of grappa or another liquor you have at home – 60gr butter – mayonnaise. For the Monsters Eyes you will need: 3/4 carrots – a can of olives already pitted (depends by the quantity of carrots you will use) and 150gr mozzarella. I will start from the black cream for the coffins. Take the pitted olives and cut them in pieces, add the butter and the gorgonzola. Mix it all with the 2 little spoons of liquor and with some olives water if you need. I suggest you to use a mixer, it will be quicker and the cream will be easier to spread on the bread. Try the cream and if you prefer a more stronger flavor, add more olives or gorgonzola depending buy your taste. Put the cream in the fridge for a bit. In the meantime you can clean the carrots from the skin and cut them in slice (not too thin). Place them 2 by 2 on the plates and add a little piece of mozzarella on top. Finish them with half of an olive and serve. Then put the bread in the toaster and when it’s ready, cut each slice in half and design the coffins in each part. Spread the black cream on each coffin and design a little cross with the mayo. In normal occasion you can just cut the bread in triangles and add a bit of mayo in the middle. PS. Mamy hai visto che carine le tombette fatte con le tue salsine? Considera che Nat se le sarebbe finite…va pazza per il gorgonzola. Invece mi ha aiutato con gli occhi dei mostri: si e’ lavata e pulita tutte le carote e si e ‘messa li ha tagliare tutti gli ingredienti! E per finire ha pure intagliato i peperoni con le faccette… troppo carini! Brava no?